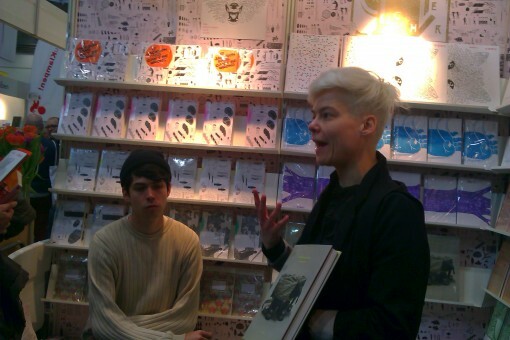 Daniela Seel of Kookbooks led a small press tour through the Leipzig Book Fair. 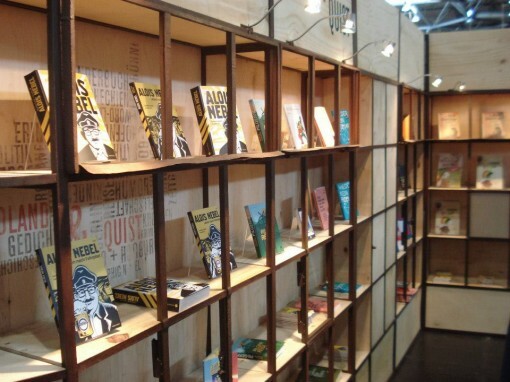 Germany’s small press scene is thriving, with an eclectic mix of ambitious publishers seeking out new authors, experimenting with formats and finding audiences. LEIPZIG: Compared with the Frankfurt Book Fair, the annual Leipzig Book Fair is something altogether different: it’s small, easy to navigate, and instead of being locked in meetings all day, many publishers hang around their stands to talk to readers about their books (at least the indie publishers). This is what the Leipzig Book Fair is really about – chatting with authors and publishers, thumbing through the newest fiction and nonfiction titles, and chance encounters at the dozens of readings and parties in Leipzig each night after the trade fair grounds close. It’s what the Germans call the “Publikumsmesse,” or trade fair for the public, and everyone’s welcome, from teenagers dressed up as Manga characters to school classes, readers and authors of all kinds. In short: it’s a lot of fun. This year, two regions were highlighted in the program: Switzerland was the annual guest country, and literature from Ukraine, Belarus and Poland was in focus in the “tranzyt.2014” series. 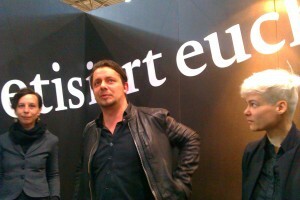 However, each year the Fair’s true focus is on the new releases and developments on the German book market. 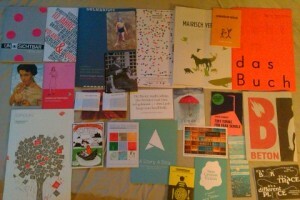 My personal highlight of the Fair was the “independent tour” of a few of Germany’s cutting edge independent presses. Daniela Seel, poet and publisher at kookbooks press, took a group of us around to around ten handpicked publisher stands, where we became better acquainted with the background and work of each press. Although none of the presses was completely new to me, each indie press had grown, broadened its scope or innovated in some way. 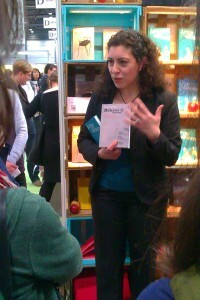 Binooki, a Berlin-based press focusing on Turkish fiction in translation, presented some of their favorite titles, including a “psycho-absurd-romantic comedy” by the Turkish novelist Alper Canigüz, which starts out with a young French teacher who wants to sell part of his life to secure the latter part on credit. The fantastical book takes cues from both Kafka and Borges, and is Canigüz’s third release with the press. Binooki was founded by two German-Turkish sisters in 2011, Selma Wels and Inci Bürhaniye, who wanted to share the many facets of contemporary Turkish literature with German readers. The next stop was Secession, a small press which focuses on world class novels, both German originals and translations, which often have a political or historical background. With these titles Secession strives to publish sophisticated books which “stand on their own” and don’t seek to reproduce bestseller formulas. Nevertheless, according to the head of Secession, Christian Uzicska, some of their books have gone on to become bestsellers and they have sold the movie rights to Glückskind by Daniel Uhly, their most successful book so far. The tour also featured some of Germany’s more prominent poetry presses, including poetenladen, Luxbooks and Verlagshaus J. Frank, along with Seel’s own press, kookbooks. Andreas Heidtmann, publisher of poetenladen, explained how his press has taken “the opposite approach” to that of most presses — namely from publishing digitally to publishing in print. The two complement each other well, since many readers who discover poets online want to buy “the real thing” in book form. 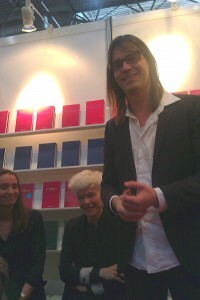 Heidtmann also spoke about the renaissance of German contemporary poetry over the last few years. He attributes it to the growing number of independent presses and online magazines for poetry, which are, in his opinion, the true experts and champions of the form. Daniela Seel from kookbooks confirmed that poetry is experiencing a comeback, and she pointed out that presses like kookbooks are active participants on the literary scene; they know their readers and cater to them, both in selecting the books they publish and creating unique events (for instance, kookbooks organized a series of literary walks last summer). We were also introduced several presses which published a mix of poetry, essays, nonfiction and conceptual art. ]Luxbooks earned a name for itself by publishing poetry, mostly from renowned American poets, but often with an original twist. For example, their John Ashberry collection features translations by 27 up and coming German poets. In 2013 they also started publishing prose (e.g. by Tao Lin, Paul la Farge, Amy Hempel and Alan Sepinwall). As Luxbooks puts it: “we want to prove that a glutton can also be a gourmet” when it comes to books. Verlagshaus J. Frank likewise publishes a diverse mix of literature. After getting their feet wet with an annual literary magazine, the team branched out to German poetry, essays, translations and illustrated books. They also put out a series of essays as mini-books, a format that seems to be more and more popular lately (from SuKultur’s simple yellow pamphlets to Readux Books‘ lovingly designed translation miniatures). This survey of German indie presses wouldn’t be complete without mentioning two presses, both of whom are unmatched in their drive to innovate and explore new territory – Mairisch and Voland and Quist. Along with Verbrecher Verlag, which received the Kurt Wolff Prize for its catalog of authors who promote freedom of thought in their work; Mairisch press was the winner of this year’s Kurt Wolff Forderpreis. With their mix of audio books, print novels, short stories and graphic novels (including a gorgeous cross-cultural story about kimchi), the Hamburg-based publishing house promotes contemporary German writers in a variety of formats – they also offer e-book editions with every print book as a bundle. Mairisch is a visible champion of independent presses. In its blog series “what does a publisher actually do?,” the press explains the effort it takes to get books into the hands of readers in a lighthearted way. Mairisch also started the German initiative Indie Book Day, which encourages readers to buy books from independent bookshops and indie presses on March 22rd. Last year’s initiative made waves online and was nominated for the 2013 Virenschleuderpreis. 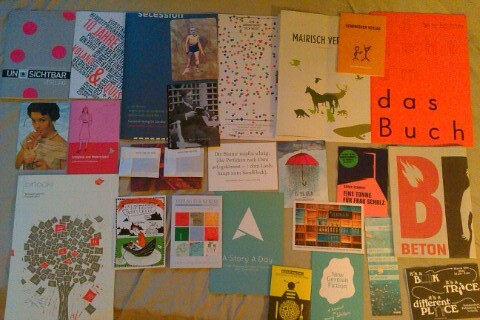 Small press catalogs on display in Leipzig. With roots that go back to Berlin’s “Lesebühne” (open mic reading) scene, Voland & Quist also publishes many new voices, including spoken word poets and short story writers, often pairing their books with CDs and DVDs with performances by the authors. Over the last 10 years they’ve added short stories, novels, graphic novels and children’s books to their catalog, and this season Voland & Quist is releasing a volume of poetry collages by Lydia Daher, which takes the press’s penchant for multimedia literature in a new direction. In April this Leipzig-based press will also release the Android and iOS app A Story A Day, in which short stories from their German language authors will be featured daily. Across all formats, genres and sizes, the independent presses in Leipzig proved to have much in common: passion for the books and authors they work with, eagerness to experiment and a commitment to reach readers. Particularly the poetry presses seem to be developing strong profiles that function like brands — and by building brands that readers trust, they are able to publish new writers alongside established poets. Meanwhile, the new voices from presses like Voland & Quist or Mairisch are finding their way to younger audiences via audio books, DVDs and even apps. But as poetenladen’s publisher reminds us, in Germany readers of all ages are still interested in reading “the real thing,” it’s those beautiful books which are made to last which draw the readers to Leipzig in droves. In Germany, maybe we’ll see how digital and print can complement each other and thrive. The efforts of these presses in 2014 point to a bright, interactive future for reading, whichever form it may take. A California native, I currently live in Berlin, where I translate from the German, edit English writing and attempt to bridge the German and English-speaking worlds because, in the words of Lyn Hejinian, “language is a medium for experiencing experience”.